The day that Jesus was twelve years old was a very exciting day and happy one—partly because it was His birthday, but more because He knew that He would now be able to go with Joseph and Mary when they went to Jerusalem to the great Feast of the Passover. At last, the great day came for starting the journey to Jerusalem. It would take them three or four days to get there, so Jesus helped Mary to pack up some warm rugs to sleep in at night, and food to eat on the way. 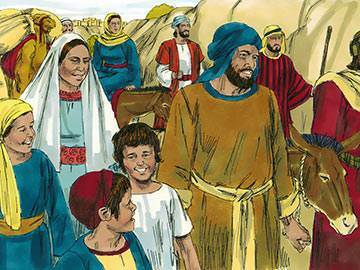 They joined a party of Nazareth friends going to Jerusalem, as it was much nicer to have company on such a long journey. What a lot of new things and places Jesus saw, and what fun they had at night when they lit fires by the roadside, and had supper, and then lay down to rest under the bright stars. 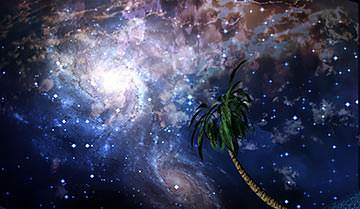 Jesus watched the stars twinkling till He fell fast asleep. 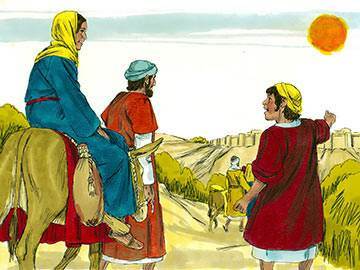 Each day they went on, until at last from the top of a hill they could see the city of Jerusalem, with the Temple shining in the sunlight. How beautiful it was! 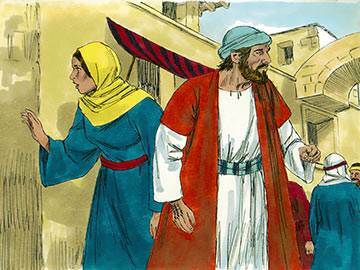 When they reached the city they passed through the great gate and into the crowded streets, and Joseph took Mary and Jesus to the little house where they were to stay. Early the next morning they went to the Temple to sing songs of praise to God with many other people. Jesus thought the Temple was the loveliest place He had ever seen, and He wanted to go there every day. 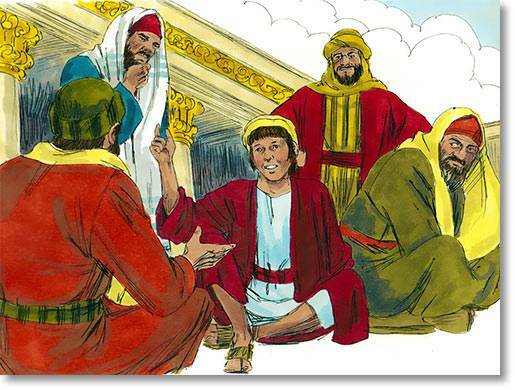 When there was no singing He liked to listen to the wise men who taught the people in the porch of the Temple. He loved to hear what the teachers said about His Father, God, and He asked many questions. Jesus was very sorry when Joseph said they would be going home next day. In the morning He got up early and went to the Temple for the last time. Mary and Joseph got ready and set out from the city once more. They thought that Jesus was with some of His little friends farther along the road, but when evening came, and they could not find Him anywhere, Mary said, "Jesus must have been left behind at Jerusalem. We must turn back to find Him." So Joseph and Mary went all the way back, feeling very worried. 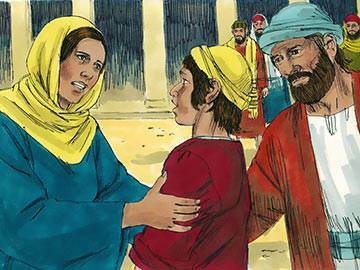 When they got to the city they looked for Him everywhere until at last Joseph said, "Let's look for Him in the Temple." 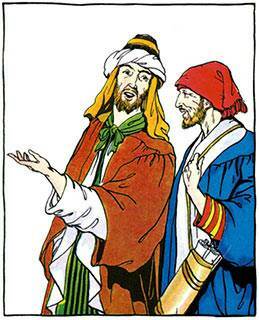 Joseph had guessed right, for there was Jesus talking with the wise men, and asking questions. Mary ran up to Him and put her arms around His neck. She was so very glad to find Him. 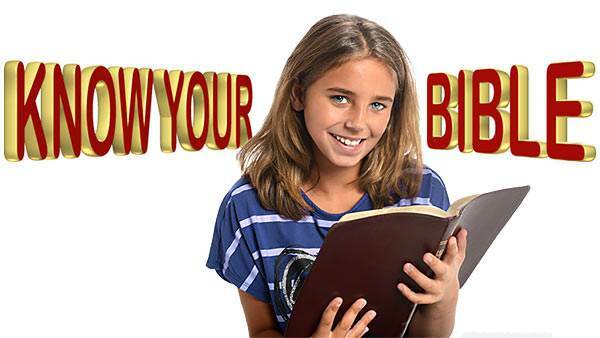 "You should not have worried, Mother," said Jesus, smiling at her. "I have been talking with the teachers about my Heavenly Father." 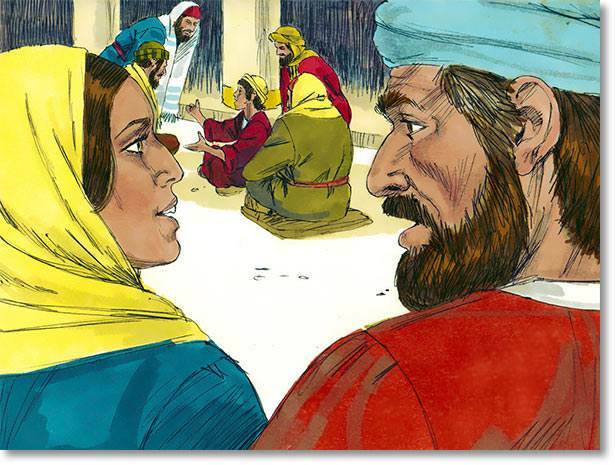 Then they set out once more for Nazareth, feeling very glad that they had found each other again.